For most people, the idea of German food conjures up images of oversized portions of meat, mountains of mashed potatoes and pale, pickled vegetables. And there’s nothing wrong with that. But after eight years of serving up the old favorites in a smoky pub atmosphere, Die Stube in Kemang has decided to take things in a different direction with a new look, new menu and a new take on German cuisine. The classics are all still there — gigantic schnitzels, potatoes fried in lard and sausages bursting at the skins — but chef Ralf Schmidt has added lighter items to the menu, introducing lean cuts of meat, delicate poached eggs and paper-thin crepes. 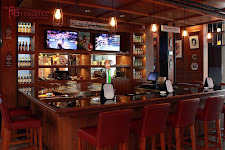 The pub area keeps the punters happy, with German beer on tap and football matches screened on weekends, while the newly opened restaurant area is smoke-free and family-friendly. It has already become a popular brunch spot for mothers to get together after dropping off their kids at the nearby international schools. The renovated restaurant space is welcoming, with a country-home feel and bric-a-brac on the walls. Like the pub, it is decorated in a nostalgic German style, with wooden beams over white walls, paneled windows and checkered tablecloths — the name Die Stube is in fact an old-fashioned German term for a cozy room. For Patrick, who was born and raised in Germany, the place is something of a home away from home for himself and for Jakarta’s sizeable German community. Patrick estimates that about 100 Germans regularly come to the restaurant. Their loyalty, he says, is testament to the authenticity of the food and atmosphere. Die Stube now boasts an all-day breakfast menu, with items like the Atlantic Eggs Benedict and the Veggie Delight, a buckwheat crepe topped with a dollop of spinach, and mushrooms dusted with cracked pepper. As for the Benedict, the lemony Hollandaise makes it a light yet substantial meal, with the runny, poached egg spilling over a thick slice of bread, topped with salmon and a pinch of caviar. For lunch, Die Stube has borrowed from its sister restaurant Imbiss Stube in Cilandak Town Square, managed by Patrick’s wife Tina Effendi. Formerly known as “Double Decker Deli,” Imbiss Stube claims to serve “the best sandwich in town,” something it has brought to the Kemang joint in the form of the DD Club Sandwich, made with ciabatta bread and filled with prosciutto, turkey, ham and hard-boiled eggs. Chef Schmidt, who worked in Bali for eight years before coming to Jakarta, was given free rein to design some light meals for Die Stube’s dinner menu. His specialty is a beef fillet steak served with sauteed vegetables and potato wedges, with a red wine demi-glace drizzled over the lot. The lean meat is lightly charred on the outside and pink on the inside, just the way a steak should be, and is so tender it can be sliced up with a butter knife. But the most popular items on the menu, Patrick says, are still the schnitzels, sausages and pork knuckles. These classic dishes are the draw card for homesick Germans, or those wanting to try real German cuisine. The sausages are made on site in the restaurant’s own home butchery, where they are filled with pork, beef or chicken and various spices. The pork schnitzel is Patrick’s own favorite. The enormous crumbed fillet, seasoned with salt, pepper and lemon, is served with a simple side of potatoes baked in either oil or lard, depending on preference. The spuds are blackened at the edges to produce a buttery, smoky flavor. This is the type of fare that has earned Die Stube its reputation as the home of real German food in Jakarta. And while the light meals are a nice touch, it is this hearty cuisine that is likely to keep customers coming back for more.